The sentimental value a piece of jewellery can hold is irreplaceable. A necklace from your darling husband, a watch from your fashionable wife or your great grandmother's wedding ring - these pieces aren't just for conspicuous display - they hold special places in our hearts that goes beyond mere esthetics. If these charms become damaged, the anxiety and grief that accompanies a tiny scratch is monumental. To alleviate the distress of scratched, scuffed or snapped jewellery, look no further than the experts at Valente Jewellers. Specializing in gold and platinum repairs, Valente has the experience and knowledge to restore any damaged piece to its sparkling original condition. Regardless of its origin or age, Valente utilizes modern laser welding technology to tend to a marred ring, bracelet, necklace or timepiece, including antiques. They are also accustomed to sizing and resizing, and battery replacement in watches. When it comes to the care of your treasured trinkets, don't leave anything up to chance. 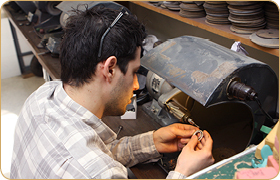 Put your jewellery in the hands of the professionals at Valente Jewellers.